Local geologist Dr. Mustafa Saribudak is a modern-day Indiana Jones. He can be found spelunking through Austin’s many caves, and is an expert on all things found under the ground! His company, Environmental Geophysics Associates, specializes in providing geophysical surveying, which helps determine the cause for sinkholes and can find buried utilities or drums. Austin sits atop the Edwards aquifer, which is one of the most prolific artesian aquifers in the world. "Beneath the surface of the Austin area there are caves, sinkholes, and conduits. The rain water infiltrates into the ground through the small cracks, fractures, faults, sinkholes and caves on the surface and reaches into the reservoir of groundwater few hundred feet below the surface. During this infiltration, rainwater penetrates into and dissolves the soluble rock layers of the Edwards Limestone. And this process has been on the work for millions of years," Dr. Saribudak says. What types of creepy-crawlies does he meet upon his spelunking quests? "Cave animals just might be some of the strangest animals on Earth. Adapted to living somewhere with little to no light and practically no vegetation, these animals have evolved to survive in extreme environments and the results are often unbelievable." One of the more unique animals – in fact, they are only in the Austin area – is the Barton Springs, Austin Blind and Jollyville Plateau salamander. "The Barton Springs and the Austin Blind salamanders are found only in Barton Springs. The third species, the Jollyville Plateau Salamander, lives primarily in the springs and streams of northwest Austin and southern Williamson County. Under the U. S. Endangered Species Act, the Barton Springs Salamander and Austin Blind Salamander are endangered, and the Jollyville Plateau Salamander is threatened, because of the ever-increasing human impact on their habitats." Sinkholes are a common occurrence in Austin, because of the limestone that is under our city. "Sinkhole is a depression or hole in the ground caused by some form of collapse of the surface layer. They are caused by the chemical dissolution of limestone rocks, and may vary in size from few feet to several hundred feet both in diameter and depth, and vary in form from soil-lined bowls to bedrock-edged chasms. Sinkholes may be formed gradually or suddenly, and are found worldwide. Fortunately, the impact of the sinkhole formation, or its collapse via natural causes, is not a major threat to the population of Austin. There has not been a recorded incident in the Austin area similar the sinkhole collapse, which has occurred in the state of Florida." Danger is not common when working in and around sinkholes, but Dr. Saribudak has been in a life and death situation, when he completing a geophysical site assessment over a Houston refinery. "I was working alone to locate a subsidence, an incipient man-made sinkhole, and suddenly I felt breathless, could not breath and fell down. My car was close by and I dragged myself into the car and started the car and the air condition. The reason for my fall was that I walked into a zone of Hydrogen Sulfide, which is an extremely poisonous gas, leaking from one of the pipes in the vicinity of the study area." Dr. Saribudak has some advice for those interested in his career. "In the early years of my career, I lived in Houston and mostly worked on the environmental problems of the Houston area. Then one day, I had a phone call from a potential client asking me if I could locate a cave in the Austin area. Of course you have to start somewhere, and I told the client that I could help him. I got the project and then I started calling on the top experts of karst geology and geophysics during the late 1990s. 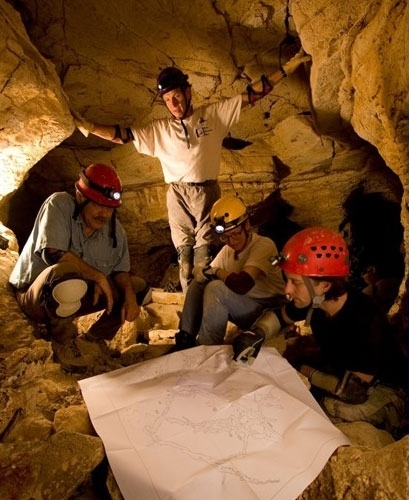 "One of the answers to my questions, which was: what geophysical method works best in locating karstic features (caves, sinkholes) came from a well-known karst geophysicist. He said: Mustafa, that is a million dollar question! And he added, he does not have an answer for me. I realized immediately that I should focus my energy and education on locating karstic features. "It has been a great journey since then and I, a month ago, wrote a karst paper that started with the title of ‘The million dollar question: What geophysical methods work best over the Edwards Aquifer?’ Although I do not have the million dollar answer, but I think I have developed an understanding of the karst and geophysical methods how to locate them."